Hopefully, your damage deposit covers the amount of damage but with the cost of construction these days, that’s not always the case. A few thousand dollars doesn’t go a long way anymore. The obvious answer is ‘yes.’ From holes in the walls to missing toilets – we’ve heard of just about everything you can imagine. 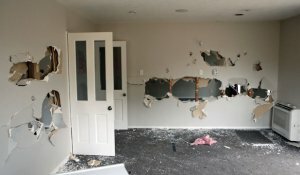 Sometimes a bit of drywall and paint will fix the problem, in which case you may want to fix it up and rent it out again, and then just accept the inconvenience as the cost of doing business. However, the damage may not be worth repairing. 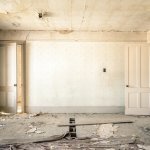 If you are planning to re-rent the house or list it on the market then your best course of action is to fix the repairs, even if the amount exceeds their damage deposit. One little-known option that is actually really helpful is to find a handyman who wants to rent the house. In exchange for a discount on rent they can fix up the house for you to make it a nice rental property again. Make sure you have a timeline all spelled out, though, to avoid then staying too long without a lot of work getting done. All work should be agreed upon up front and documented. Another option is to sell the house and move on from owning a frustrating rental property. However, be aware that if you try to sell the house on the open market, you may have to fix it up first in order for the agent to list it. Another option is to sell privately to a house-buying team like ours. We buy houses in as-is condition and we’ll fix them up ourselves. So when tenants trash your house, fear not. You have options! To get a fair cash offer for your property, no matter what condition it’s in, just get in touch with us and we’ll give you a no-obligation offer and we can even buy your property from you fast. Click here now and fill out the form or call our office at 877-210-6460 and we’ll get back to you right away.